New Rally-X is an arcade title published by Midway. It takes the Rally-X game design and reimplements it with a number of updated features. 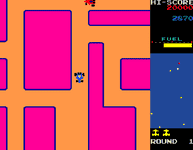 Like in the first game, players drive a blue racing car through a maze, collecting flags. A number of red cars chase the player, but they can be stunned by deploying a smokescreen. Each stage provides a limited amount of fuel that depletes as time progresses. Each smokescreen uses up a small amount of fuel as well.